Karen Sheriff has worked with Attorney Cognetti for over twenty years. As Ms. Cognetti’s paralegal, Ms. Sheriff’s primary responsibility is the management of all aspects of the family law process including the drafting of pleadings and motions; managing discovery issues; deposition preparation; document productions; and trial preparation and support. At Cognetti & Associates, we use a team approach when handling client’s cases, and Ms. Sheriff is an integral part of this team. From client and case load management to legal research and writing, Ms. Sheriff is an irreplaceable asset to the firm who has garnered the respect of both clients and opposing counsel. Ms. Sheriff received her paralegal degree in 1988 from Central Penn College, and, through her work with Ms. Cognetti, has gained over 25 years of experience in family law litigation and non-litigation matters. Ms. Sheriff received her Pennsylvania Certified Paralegal designation from the Keystone Alliance of Paralegal Associations and has been a Notary Public for more than 20 years. 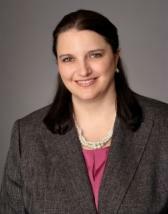 She is also member of the Central Pennsylvania Paralegal Association.